An analytical balance is a balance designed to measure small mass in the sub-milligram range. The measuring pan of an analytical balance is inside a transparent enclosure with doors so that dust does not collect and so any air currents in the room do not affect the balance's operation. This enclosure is often called a draft shield prevents balance fluctuations. 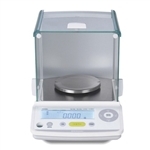 We have several Mettler Toledo and Sartorius analytical balances. See below for a list of our balances.